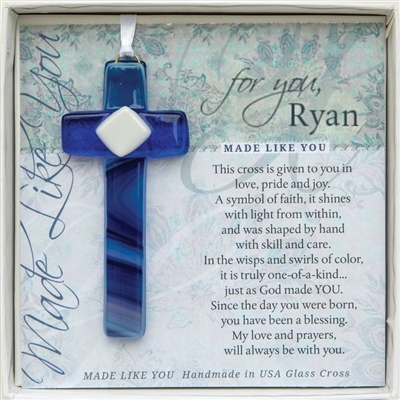 A unique religious gift for your son, now available to be personalized! Our 4" handmade glass cross for son hangs from a white satin ribbon, and is perfect for display anytime of year and any place... a rear view mirror, window, drawer knob, bible page marker, ornament stand or Christmas tree. Son cross comes gift-boxed in white 5.5x5.5 clear top box with Made Like You sentiment and art. Your son will love the message this gift of faith sends!